BEVERLY HILLS, CA and LANGHORNE, PA--(Marketwired - June 21, 2017) - Pop Warner Little Scholars, Inc., the nation's oldest and most prominent youth football, cheer and dance organization, and Genius Brands International, Inc. "Genius Brands" (NASDAQ: GNUS), a global media company that creates and licenses multimedia animated content for children, appoints Genius Brands' hit music-driven tween series SpacePOP as the Official Music Provider for Pop Warner Little Scholars Cheer and Dance program, engaging participants and audience of 325,000 Pop Warner student-athletes across the U.S.
As the Official Music Provider, SpacePOP music will be utilized in Pop Warner's dance and cheerleading workshops, camps, games and at competitions across the country through the end of the year, culminating in the national championships to be broadcast across a family of ESPN networks. Multiple Grammy Award-winning producer and music veteran Ron Fair (Fergie, Mary J. Blige, Black Eyed Peas, Pussycat Dolls, Christina Aguilera and more) together with his singer songwriter spouse Stefanie Fair (founding member of RCA's girl group Wild Orchid with Fergie) created the SpacePOP theme music; and veteran music producer and composer John Loeffler (Kidz Bop, Pokémon) created the songs that will be incorporated into the routines. "We strive to work with exceptional brands that share our commitment to creating positive experiences for our student-athletes and this relationship with Genius Brands is a perfect example," said Jon Butler, executive director of Pop Warner Little Scholars. "In their lyrics, SpacePOP provides uplifting messages of empowerment for young girls. We're excited about this partnership and we know the young girls who cheer and dance, and those who play football, will appreciate a fun, new addition to the Pop Warner experience." "Pop Warner's mission -- the empowerment of kids though education, entertainment and team building -- aligns with the SpacePOP brand values. Through this collaboration, thousands of cheerleaders and dancers participating in the competitions and audiences attending will have the opportunity to become familiar with SpacePOP, if they aren't already, or see it and experience it in a unique new way," commented Stone Newman, President, Global Consumer Products, Worldwide Content Sales & Marketing at Genius Brand. "The creation of original choreographies, cheer and dance routines to the remixes of the SpacePOP songs will showcase our content in an entirely new way that our fans around the world will love. 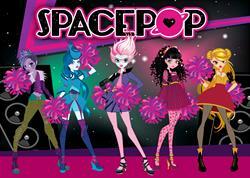 These routines will motivate and encourage girls of all ages to get up and be active with SpacePOP!" The wildly popular SpacePOP animated series features over 100 short-form episodes and original music videos, which, since debuting on YouTube last year, have garnered over 16 million channel views, 55,000+ subscribers and approximately 300,000 hours of viewed programming. In this empowering, entertainment and adventurous series, original music is woven into a narrative that follows five teenage princesses who disguise themselves as musicians and form a band while they secretly plot to vanquish an evil Empress who is seeking to enslave the galaxy. 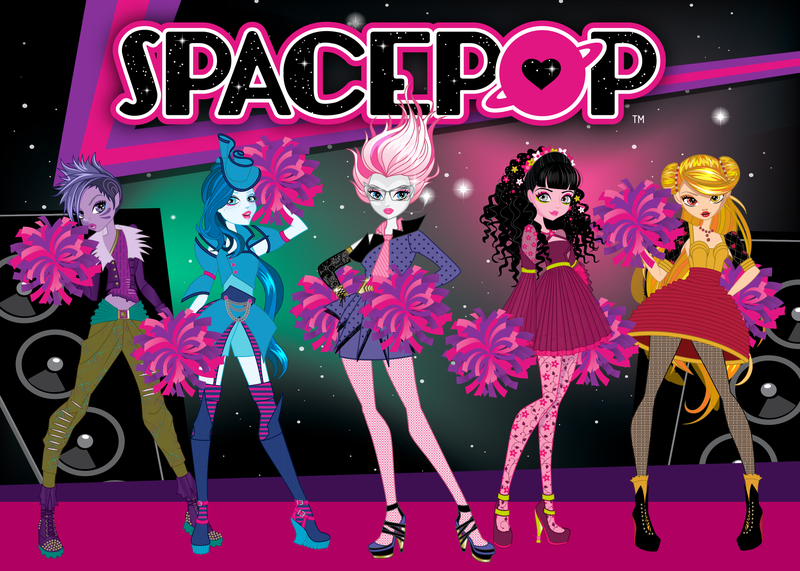 In addition to YouTube, SpacePOP content is currently available in the U.S. on digital platforms, including Toon Goggles, PopJam, BatteryPOP and the Kid Genius Cartoon Channel on Comcast, as well as on OTT platforms, including Amazon, Apple, Roku, and Google, bringing the combined audience reach to nearly 50 million households. And, SpacePOP music from Sony Music's Legacy label is available on iTunes. Additionally, in September 2017 SpacePOP will make its big screen debut in theaters nationwide. Founded in 1929 and headquartered in Langhorne, PA, Pop Warner Little Scholars is the nation's oldest youth football, cheerleading and dance organization and the only youth sports organization that emphasizes academics as a prerequisite for participation. Pop Warner participants enjoy the opportunity to learn and compete in their sports in an atmosphere that emphasizes fun, safety, academics and character. For more information on Pop Warner and its programs visit popwarner.com or follow Pop Warner on Twitter @Pop_Warner, Facebook @PopWarnerLittleScholars, Instagram @popwarnerlittlescholars and Snap @popwarner1929. Headquartered in Beverly Hills, California, Genius Brands International, Inc. (NASDAQ: GNUS) is a leading transmedia storytelling company developing, publishing, marketing and licensing branded children's entertainment properties and consumer products for traditional, digital and emerging media distribution and retail channels. Led by award-winning creators and producers, Genius Brands distributes its content worldwide in all formats, as well as a broad range of consumer products based on its characters. In the children's media sector, its portfolio features "content with a purpose" for toddlers to tweens, which provides enrichment as well as entertainment, including new preschool property Rainbow Rangers; tween music-driven brand SpacePOP; preschool property debuting on Netflix Llama Llama; award-winning Baby Genius, re-launched with new entertainment and over 40 new products; adventure comedy Thomas Edison's Secret Lab®, available on Netflix, public broadcast stations and Genius Brands' Kid Genius channel on Comcast's Xfinity on Demand; Warren Buffett's Secret Millionaires Club, created with and starring iconic investor Warren Buffett. The Company is also co-producing an all-new adult animated series, Stan Lee'sCosmic Crusaders, with Stan Lee's Pow! Entertainment and The Hollywood Reporter. Additionally, under Genius Brands' wholly owned subsidiary, A Squared Entertainment, the company represents third-party properties, including Celessence Technologies, the world's leading micro encapsulation company, across a broad range of categories in territories around the world. For additional information please visit www.gnusbrands.com. Genius Brands International's (NASDAQ: GNUS) hit music-driven tween brand SpacePOP appointed the Official Music Provider for Pop Warner Little Scholars Cheer and Dance program, engaging participants and audience of 325,000 Pop Warner student-athletes across the U.S.